Bonnie Brae Cleaners understands the importance of your wedding dress, and the wish to preserve memories of a very special celebration. We offer both cleaning and preservation services in order to keep your dress as beautiful as the day you walked down the aisle. Cleaning your wedding gown soon after your ceremony is a very wise decision to maintain its appearance. 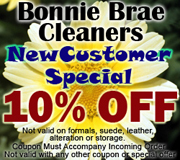 Bonnie Brae Cleaners also offers wedding gown preservation for new or old dresses while using best care practices.